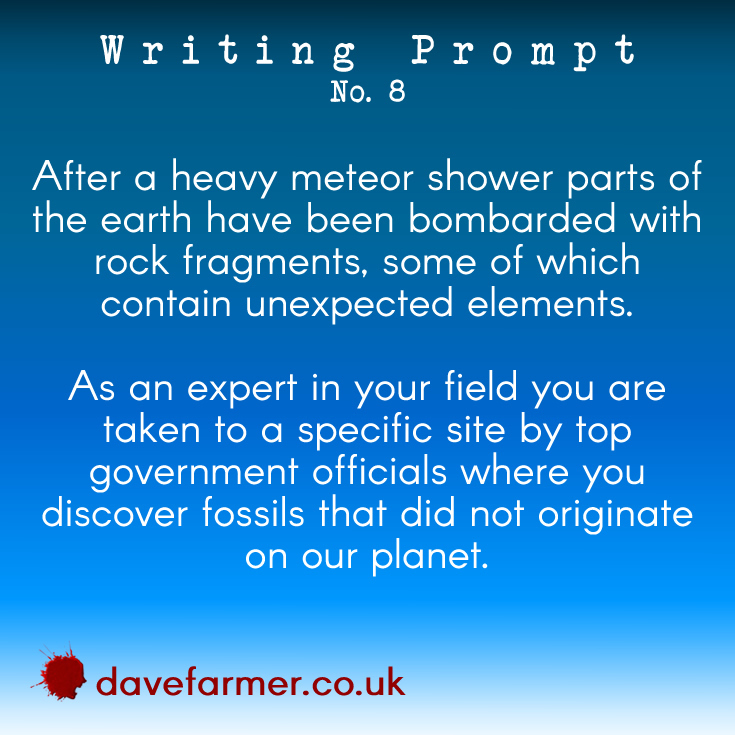 Today’s writing prompt was put together at the centre of the sun. That’s what it feels like. The UK is baking, and I’m very much loving it! It’s hot and sweaty. People are out and about, smiling, scoffing ice cream, and generally looking happy. I’ll take any prolonged heat wave every day over the months of dreary grey winter crap we endure in Blighty. 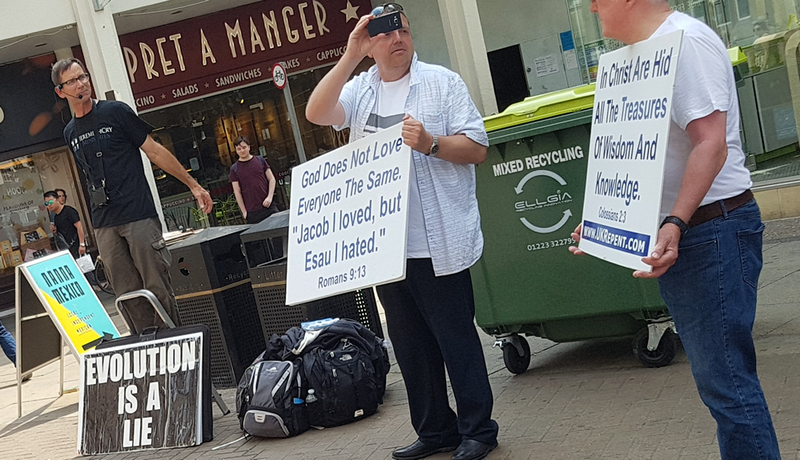 Yesterday, whilst taking a leisurely Pokemon Go stroll through the beautiful Cambridge city, I happened across three religious preacher types giving it loads about God and Jesus and how jolly nice they both are. Harmless folk, possibly a tad bonkers, but everyone’s entitled to their beliefs, right? So long as it’s not harming anyone, or provoking others to cause harm. There was a guy with a microphone shouting about how God loves only the chosen ones, and not everyone is entitled to his love. He received some heckling here and there, but he wasn’t put off. They’re very serious about God and His Word aren’t they? 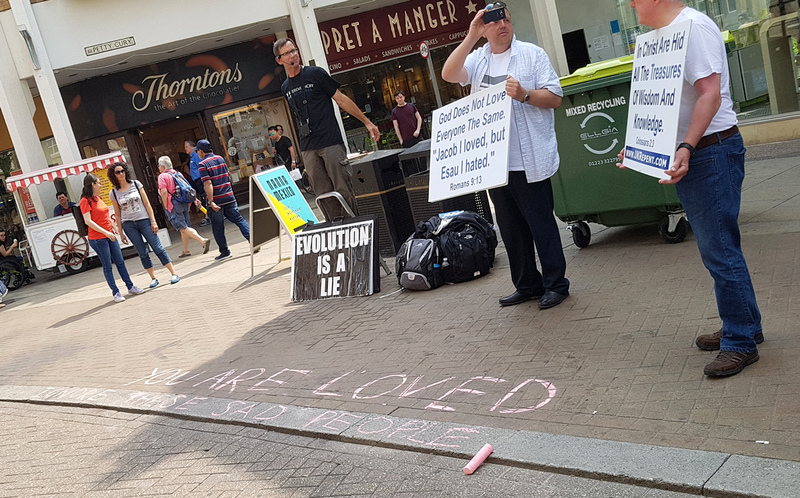 It’s too hot today to get all riled up over evolution versus creationism, save to say I find those who believe in only the latter are deluded and, in some cases, dangerous. That photo doesn’t show the complete picture. Just out of sight there was a guy doodling words on the ground – a peaceful protest you could say – where the preachers had freedom to speak their message, so did the Quiet Man at their feet. The Quiet Man wrote his message with a huge pink chalk, then walked away. He was hassled by the sign toting duo and returned to find out what they had to say. Turns out they didn’t like what he’d done, and gave him a hard time about it, gesturing, pointing, frowning and smirking at him. They also threw a few innocent hard-done-by smiles at passers by, maybe in the hope of gaining some sympathy. I saw this little scene in two distinct ways. First, Quiet Man didn’t need to protest the way he had because he must have known it could spark an argument, or even prompt violence from the Holy Trinity or passers by. Second (the one I’m leaning toward) – Quiet Man stated his piece in the best possible way, and good for him. I’ve witnessed these loud mouthed God people plenty and not once have they ever stopped to engage people in quiet, clear, respectable debate. They shout their claims as loud as possible for as long as possible. A good 20 years ago, I was accosted by a similar preacher man spewing his specific brand of religious buzzwords and carefully memorised snippits from the bible. He caught my eye and called me a sinner and that I was bad to the bone – only God could save me. This he shouted at the top of his voice, just like the guy in this photo. I exchanged a few words with him, being a young twenty something I was quick to respond, thinking I knew better. Preacher Man ran through his one-on-one speech, though loud enough to everyone else to hear he was giving a young sinner a good telling off. These days I’m more pragmatic, patient and feel I’ve earned the right to speak my mind. I didn’t speak to these people yesterday because I could tell from the look in their eye they would never listen to reasonable debate. I wanted to feel sympathy for them, for their blindess of what could be, and how there’s a slight chance they might be wrong, if only they’d step outside of their tiny bubble and listen and respond to reasonable debate. I could have said something along those lines, but I figured the Quiet Man summed up my feelings on their argument – you are indeed loved. And that, dear blog reader, is what made my day yesterday, more so than the glorious summer sun, the stroll through Cambridge, or the numerous Pokemon I caught and evolved! You are right that they weren’t worth arguing with when they’re on a “religious” high. People like that have stoppers in their ears. The rubbish they’re spouting speaks for itself, and if they’re the chosen ones, who wants to be part of their clan! …But if you’re going to argue with them, then the silent pink chalk treatment is probably the best (akin to Jesus writing in the sand)! I suspect it’s those select few loud mouthed ignorant types who taint the image of those peaceful, learned other people who are devoted to their religion. You hit the nail squarely on there with the “religious high” as that’s what it looks like when I see them in street spewing their important words. The world is indeed a strange and wondrous place!